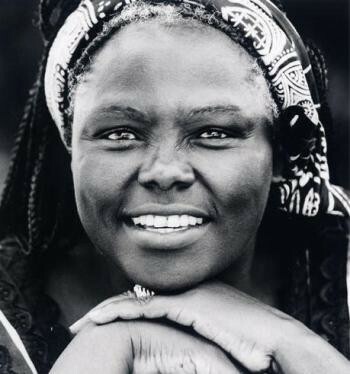 Wangari Muta Maathai (1940–2011): Nobel Peace Laureate; environmentalist; scientist; parliamentarian; founder of the Green Belt Movement; advocate for social justice, human rights, and democracy; elder; and peacemaker. She lived and worked in Nairobi, Kenya. Wangari Maathai was born in the village of Ihithe, near Nyeri, in the Central Highlands of Kenya on April 1, 1940. At a time when most Kenyan girls were not educated, she went to school at the instigation of her elder brother, Nderitu. Principally taught by Catholic missionary nuns, she graduated from Loreto Girls’ High School in 1959. The following year she came to the United States through a scholarship program of the African American Students Foundation—what became known as Kennedy “Airlift,” because a Kennedy family foundation helped fund the effort. Professor Maathai studied at Mount St. Scholastica (now Benedictine College) in Atchison, Kansas, where she completed a bachelor’s degree in biological sciences. In 1966 she earned a master’s degree at the University of Pittsburgh. That year she returned to a newly independent Kenya, and soon after joined the School of Veterinary Medicine at the University of Nairobi. In 1971 she received a Ph.D., the first woman in east and central Africa to do so. She became the first woman to chair a department at the University and the first to be appointed a professor. In the 1970s Professor Maathai became active in a number of environmental and humanitarian organizations in Nairobi, including the National Council of Women of Kenya (NCWK). Through her work representing women academics in the NCWK, she spoke to rural women and learned from them about the deteriorating environmental and social conditions affecting poor, rural Kenyans—especially women. The women told her that they lacked firewood for cooking and heating, that clean water was scarce, and nutritious food was limited.